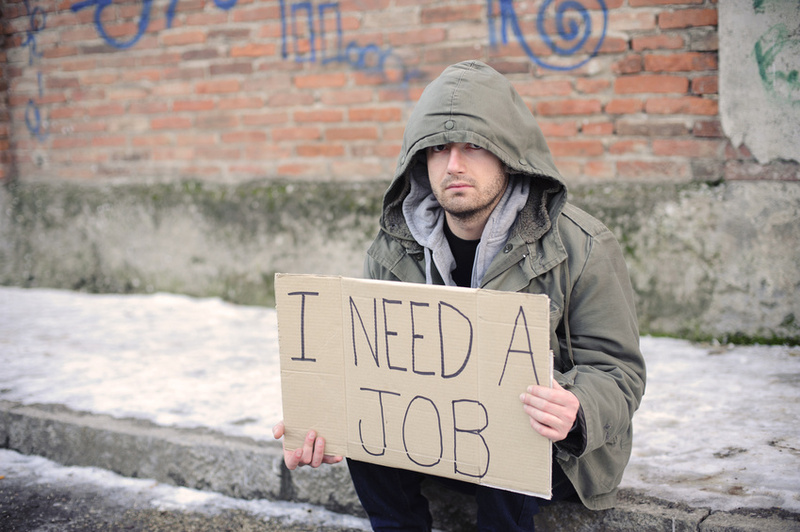 Millions of currently wasted hours are waiting to enter the legitimate economy. Those transactions need to be instant and effortless. Imagine your national government has aligned its official facilities with new markets for ad hoc economic activity. The core platform, perhaps called the Central Database for Available Hours (CEDAH), was launched successfully by a consortium of technology companies and financiers. It has grown swiftly as countless entrepreneurs have started operating new sectors. The markets are bound by public service obligations. This is a regulated utility but independent of government, funded by a small percentage mark-up added to each purchase. All the markets interlock and immediate data about supply/demand/pricing in any sector or locality is freely available. Now imagine you have has an account set up on CEDAH. It involved dropping into any local government facility with proof of identity. Today you want to fix a babysitter for your two children this afternoon. You take it for granted you can do it in 30 seconds, with complete reliability, at the lowest costs possible. > For simplicity we will illustrate your use of CEDAH with simple, generic, mock-up screens. To see actual screens from our operational systems: UltraFlexi.com. Has all the legal requirements of a babysitter. That might include, for example, absence of criminal convictions and possession of a child first aid certificate. Both are checked against official databases with each seller’s permission. Has cleared any market entry hurdles. 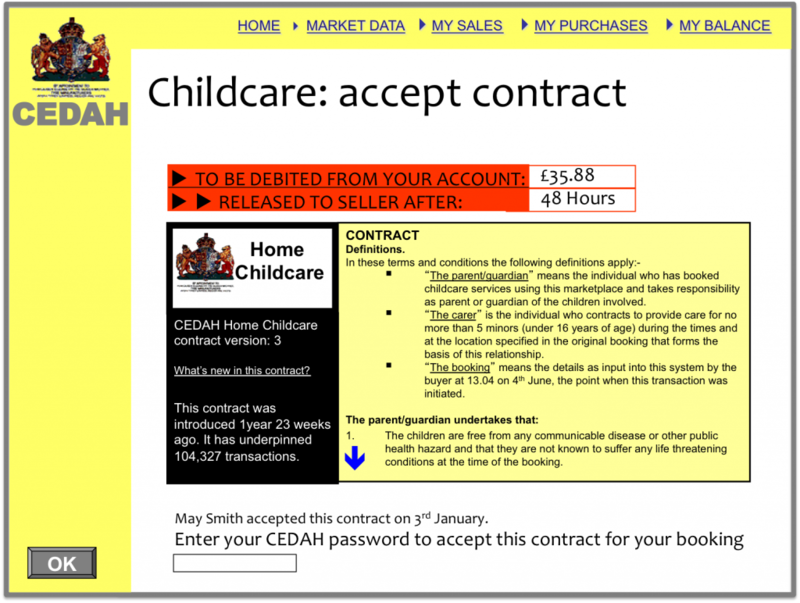 CEDAH’s’ operators may have set a threshold of activity in less sensitive sectors before anyone can sell childcare. 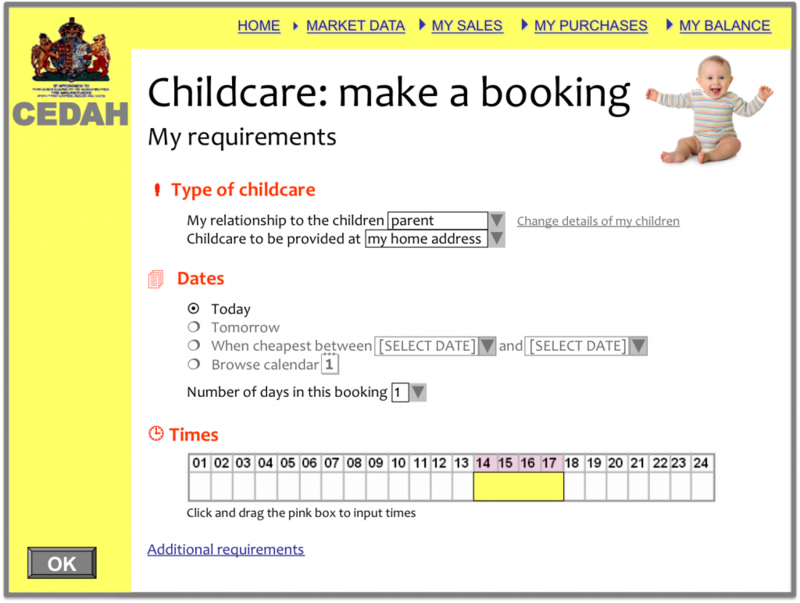 It might be that before a seller can enter the babysitting market they have to successfully complete a minimum 50 bookings spread over at least 10 buyers in the Parents’ Help sub-market. Those bookings involve entertaining, feeding, bathing or bedding children while a parent remains at home. Has personal rules for accepting bookings that align. Each person has a travel radius from their home that includes your address, is contactable in plenty of time and has personal rules about accepting bookings that show the period of notice, length of booking and other factors about your requirement are acceptable to them. Would be legally compliant. Every seller is checked against personal working time controls or restricted hours before being offered for your booking. Has a tax status known to CEDAH. Each is either working for themselves legally or has been vetted by a bona fide agency to offer childcare. Agency workers are identified by the organisation’s logo. They may cost more but there’s value add. Is graded by their track record of reliability across CEDAH. Those in the top levels have done hundreds of bookings for dozens of buyers with minimal problems. They will probably charge a premium for that solidity and experience. Has been priced for your specific need this afternoon. The system has calculated each person’s hourly rate based on their rules applied to factors such as travel distance and other parameters of your requirement. The rate includes tax and system charge. Within each grade, sellers are listed in price order. The cheapest on the left are likely to be individuals who live most locally and particularly like bookings that match your need today. You can click on any name to browse a full profile and track record across all the sectors in which that person trades. You may want to filter the available sitters: looking at those associated with your kids’ schools perhaps or the ones that have done at least three bookings for friends who have allowed you to reference their CEDAH booking list. Short of cash? Look round the lower levels of sitters and select someone who might need a bit of oversight but seems keen to do well in the market. Perhaps you anticipate needing a lot of babysitting? 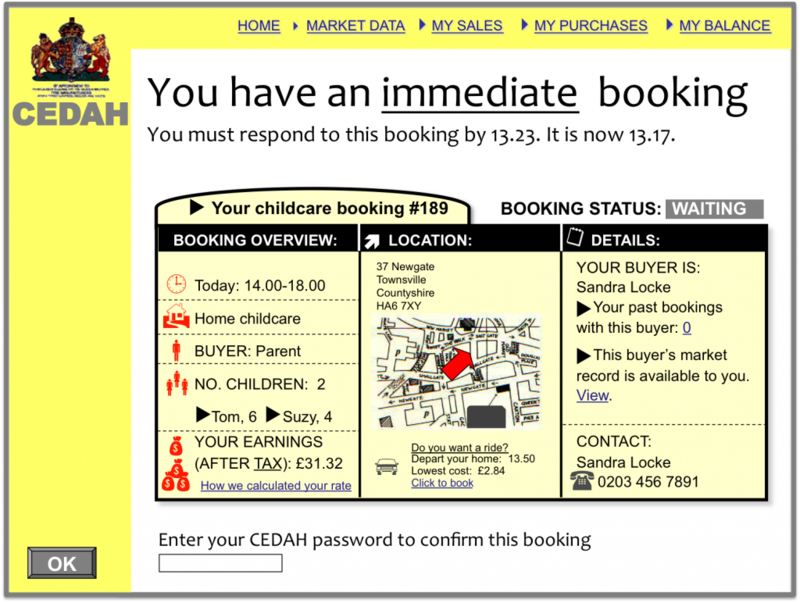 CEDAH could find you the five local sitters with availability patterns closest to your times of need. Then you could hire each for a one hour interview and trial. From then on CEDAH could show when your favourites were available and your external commitments could be scheduled accordingly. But you are time sensitive. 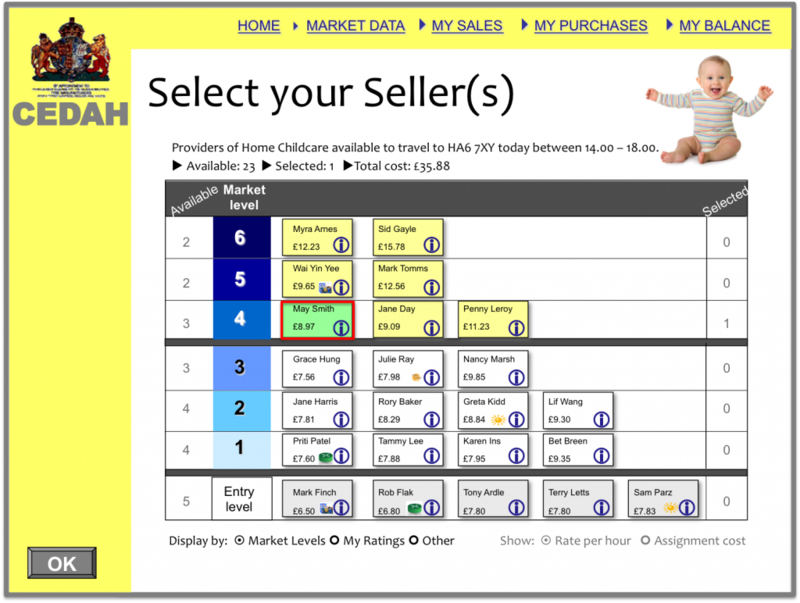 One click on a provenly reliable, modestly priced, seller guarantees your children will be in good hands this afternoon. The chosen sitter has passed multiple vettings and been through dozens of bookings in all sorts of circumstances. She welcomes bookings like yours and would suffer a significant economic penalty if underperformance today led to downgrading in CEDAH. All this is enshrined in the contract now offered. So is the way CEDAH will resolve any dispute between you using automated tools. If it can not get to an agreed solution it will up the stakes by passing the collated evidence directly into the court system. Re-enter your password and CEDAH will deduct the sum from your bank account, CEDAH account, credit card or whatever payment method you chose. It will hold this money until after the booking. This gives you, or the sitter, the chance to instigate a complaint procedure. If neither of you do this, the funds – minus tax, any agency fees and CEDAH’s’ own commission – are deposited in the seller’s account after 48 hours. Across town, your chosen sitter is immediately contacted by text, robocall, web alert or whatever channels she wishes. She knows the alert is only coming because she is specifically available and you are willing to pay her rate for a booking that is within all her parameters. This is a short period-of-notice booking, she has 30 minutes to confirm. If she fails for any reason, CEDAH has plenty of time to reschedule and may limit her ability to offer short notice bookings if she can’t honour immediate contactability. The system never makes anyone do anything, but it rigorously ensures everyone does what they say they will. That is why reaching a high level of reliability is so valuable. Your sitter is in this market because government is the biggest buyer of child related work and its requirements now go through CEDAH. That has given her a flow of bookings as a registered classroom assistant. She is trained to care for physically disabled youngsters and has benefited from government issuing vouchers to qualifying parents. Each “voucher” is just a CEDAH purchasing code that allows them control of the times, workers and locations for care they need. With a monthly cap on spend, they are vigilant in ensuring value from the market. CEDAH can constantly suggest opportunities in other markets based on local gaps in supply and her skills. Home hair cutting for children? Elder care? Sports activities in schools? It’s her choice, but decisions are fully informed. CEDAH is constantly gravitating towards equilibrium in supply, demand and pricing. This data is not just hyper-local; the system runs regional and national indices. It may be that a 10 point surge in demand for home childcare is now as newsworthy – and actionable – as a rally in the Dow, FTSE or Hang Seng.